Schlock-Wire: MDD Unearths A Cache Of Vintage Disco With PAJ DISCO MIX – Schlockmania! 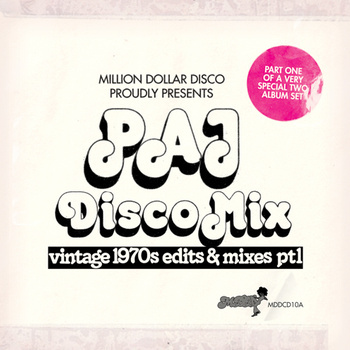 PAJ Disco Mix, a Canadian trio of DJs, produced all of these edits between 1975-1978. Some made it onto acetates, cut at New York’s Sunshine Sounds Studios and were distributed through David Mancuso’s New York Record Pool. Some got no further than reel to reel tape (some were even only originally recorded on cassette!). But they all got club play thanks to PAJ Disco Mix’s relationship with Canada’s top DJ of the time, The Limelight’s Robert Ouimet. This is a very special project that Million Dollar Disco are proud to present as our tenth CD release.